Understanding some of the math involving an engine's breathing, or pumping capacity, is vital to predicting the ultimate potential of that engine. A well understood measure is a simple formula to calculate "mean gas speed of the inlet valves". This is called the "Lovell Factor". For example, to show the progress in modern racing engines, first take a look at an earlier Formula1 engine, the Cosworth DFV four valve V8: With a bore of 90 mm, a stroke of 58.94 mm, 36.5 mm inlet valves, and an rpm limit of 11,000 RPM, these specifications yield a "Lovell Factor" of 65.7 meters /second. This was the final variant of the venerable Cosworth V8. The modern V10's, and now the mandated V8's in Formula 1, have RPMs in the 19,000 to 20,000 RPM range, and the "Lovell Factors" are in the regions around 70 to 77 meters per second, mean inlet valve gas speeds. This is necessary to produce the insane amounts of power they produce. Pneumatic valves, variable length inlet trumpets, exotic coatings and lightweight components are required to keep the engines alive and to make this much power, which is around 300 horsepower per liter. Compare this with your engine. You may see that your inlet mean gas speeds are going very high in some cases which could indicate your valve area is insufficient for the speeds. Bore-- diameter specified in mm. Stroke-- Total movement vertically, top dead center to bottom dead center. Specified in mm. Valve Diameter-- actual diameter of the widest portion of the head of the valve. Specified in mm. Number of Inlet Valves per cylinder: In a two valve engine this would be one. In a four valve engine this would be two. Peak RPM: This is the maximum RPM your engine will see. Be sure entries are in millimeters as the result will be calculated as a Mean Gas Speed in Meters/Second. Your Engine's Bore mm 80" Evo 84.85 mm; Twin Cam 88", 95.25 mm; ORCAs: 113", 101.60 mm; 126" 111.125 mm; 132", 107.95 mm; 139", 111.125 mm. You Engine's Stroke mm 80" Evo 107.95 mm; Twin Cam 88", 101.60 mm; ORCAs: 113", 114.30 mm; 126" 106.32 mm; 132", 117.475 mm; 139", 117.475 mm. Inlet Valve Diameter mm 80" Evo 46.736 mm; Twin Cam 88", 146.736 mm; ORCAs: 113", 53.34 mm; 126 /132/139" ORCAs, 56.39 mm. Number of Inlet Valves Per Cylinder Two valve heads enter 1. Four valve heads enter 2. Five Valve heads enter 3. Peak Engine RPM rpm This is the absolute peak rpm your engine will reach. Do not use commas. 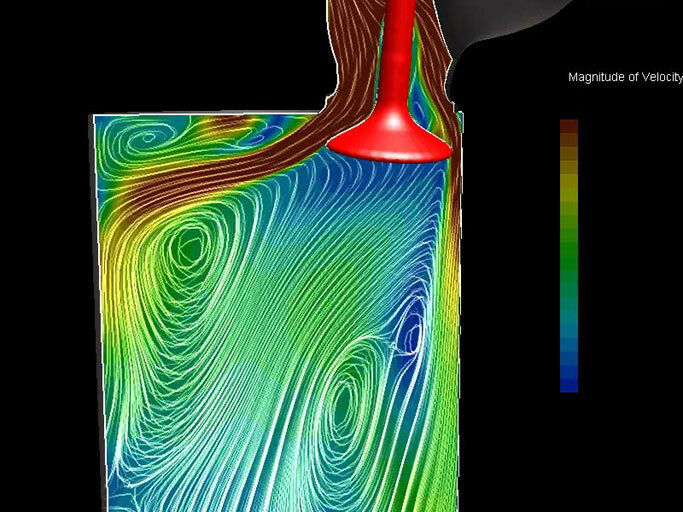 Note: Graphics above are a CFD, computer-generated, representation of inlet port flow. Mean Inlet Valve Gas Speeds are an indication of your engine's ability to breathe and make power. At the current logical extreme, in the world of Formula1 19,000 rpm engines, the "Lovell Factor" hovers around 70 to 77 meters per second. These engines are three liter engines that make close to 900 horsepower, or almost 5 horsepower per cubic inch, without any form of forced induction. Compare this with the low speed long stroke Harley engine. As they say "RPM"...ruins peoples motors. Look up the specifications on a 17,000 rpm 600cc sportbike and see how close they measure up to F1 technology...$10,000 v. $500,000,000.00 !!! !